You’ll also find out what’s been bugging Bernie about his health and well-being and how I’m making a Body Kindness choice that feels like failure, but I’m not letting it get me down! 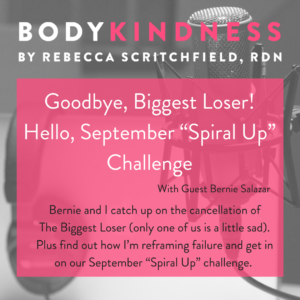 Plus, Bernie dishes on his mixed emotions about the cancellation of The Biggest Loser and while I feel anything BUT sad about the chopping block, I empathize with him. Finally, I announce a September “spiral up” challenge celebrating National Yoga Month. I’m using it to reconnect to the mind and body image benefits I have received from yoga and I hope it inspires you to open up to the benefits of yoga that honestly have little to do with “body sculpting” and everything to do with breath, awareness, and compassion. Did you enjoy the podcast? We’d love if you could leave a rating on iTunes. Have a show idea or guest recommendation (even yourself!) E-mail podcast@bodykindnessbook.com to get in touch. Join us on the Body Kindness Podcast Facebook group where you can continue the episode conversation with the hosts, guests, and fellow listeners. See you there!